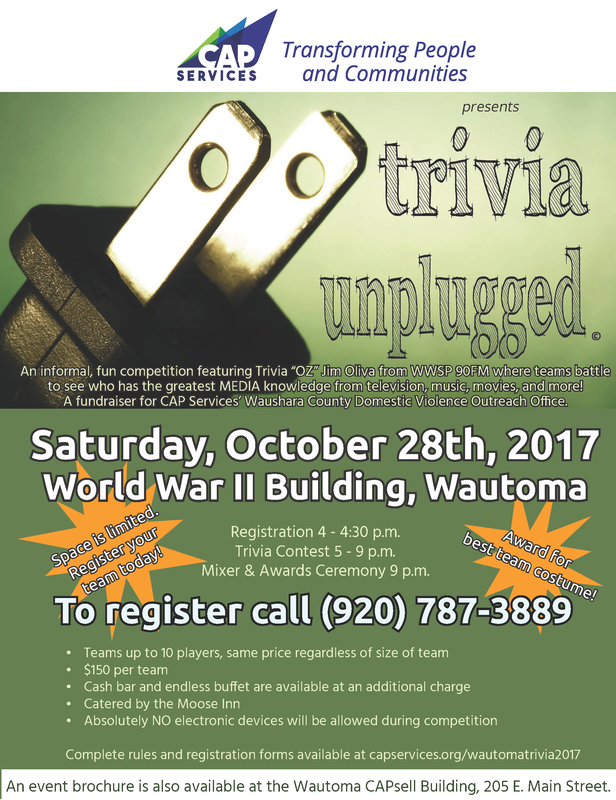 Wautoma Trivia Unplugged 2017 – CAP Services Inc.
A fun twist on a popular central Wisconsin trivia contest will be held in Wautoma Saturday Oct. 28, 2017, to raise funds for CAP Services’ Domestic Abuse Outreach efforts in Waushara County. Trivia Unplugged runs from 5 to 9 p.m. at the World War II Memorial Building, 440 W. Main St., Wautoma. It challenges teams of up to 10 players to test their pop culture and media knowledge with questions about the Trivia of radio, television, music, sports, and other topics. Jim “The Oz” Oliva, who writes and organizes WWSP 90FM’s World’s Largest Trivia Contest at UW-Stevens Point, will write the questions and host the Wautoma event. Unlike the radio contest, teams are not able to use electronic devices to search for answers. The rules prohibit cellphones, computers, and communications devices. Books and outside paper are also not allowed. Teams are asked a total of 64 questions, 16 questions per hour over four hours of the event. Points are determined based on how many people answer correctly – the fewer the number of correct answers, the higher the points, and vice versa. The team with the highest point total at the end of the night takes home a trophy. All proceed from the event went to CAP Services Domestic Abuse Outreach Office in Waushara County. Funds help support CAP’s domestic abuse intervention services including domestic violence intervention, support groups, and community response.